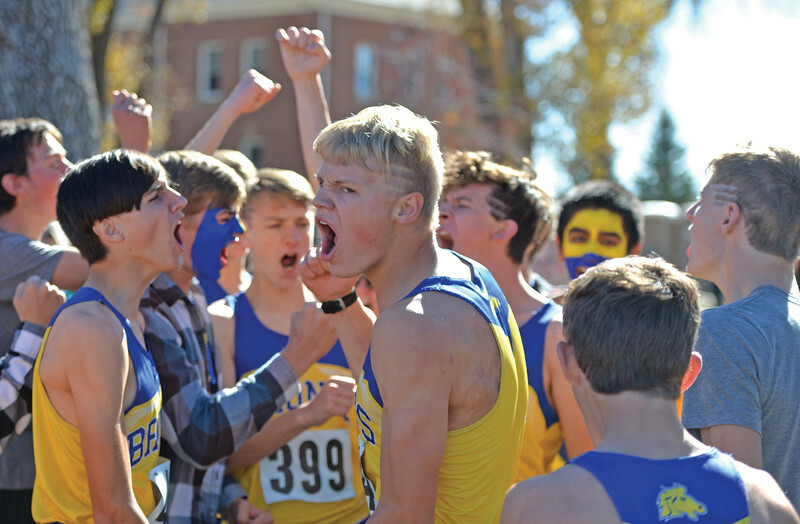 Sheridan’s Wyatt Shaw gets pumped up before the boys 4A race during the state cross-country meet at the Sheridan Veterans Affairs Medical Center Saturday, Oct. 20, 2018. 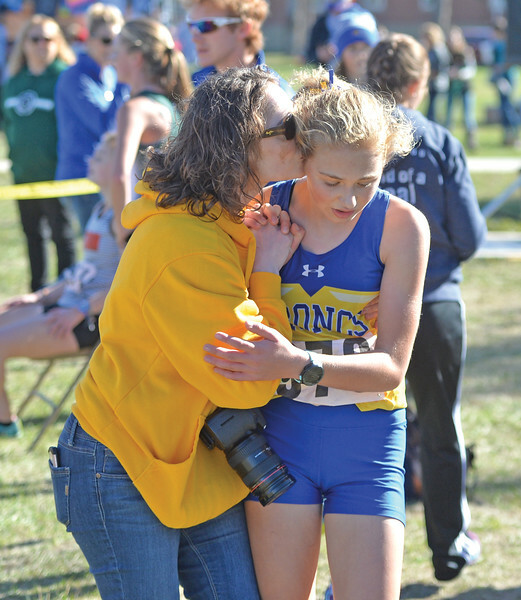 Sheridan’s Katie Turpin is greeted by her mother during the state cross-country meet at the Sheridan Veterans Affairs Medical Center Saturday, Oct. 20, 2018. 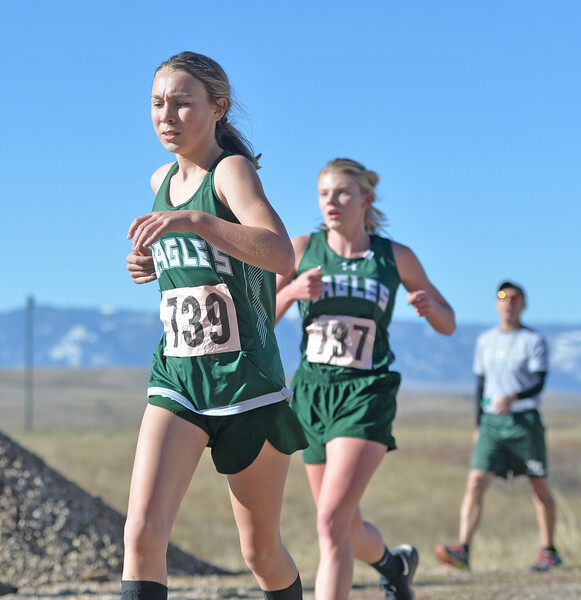 Tongue River’s Chloe Wilson leads a pack of runners during the state cross-country meet at the Sheridan Veterans Affairs Medical Center Saturday, Oct. 20, 2018. 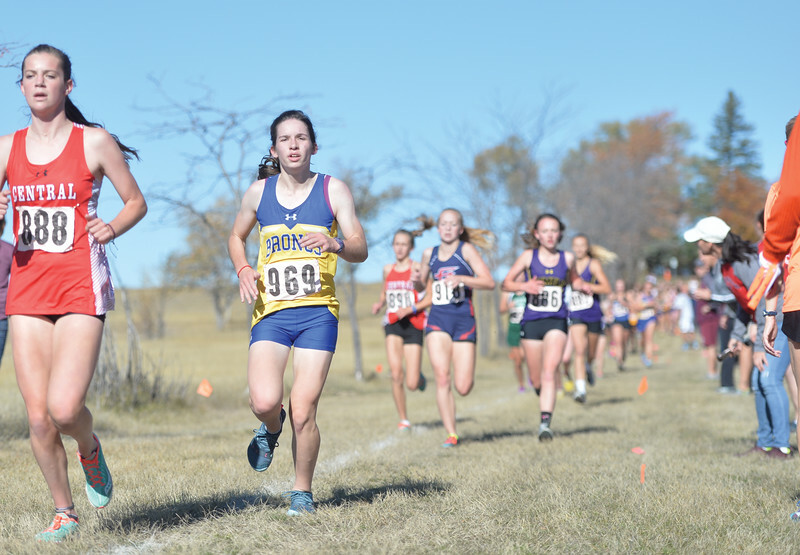 Tongue River’s Macey McArthur races during the state cross-country meet at the Sheridan Veterans Affairs Medical Center Saturday, Oct. 20, 2018. Tongue River’s Macey McArthur crosses the finish line during the state cross-country meet at the Veteran Affairs Medical Center in Sheridan on Saturday, Oct. 20, 2018. 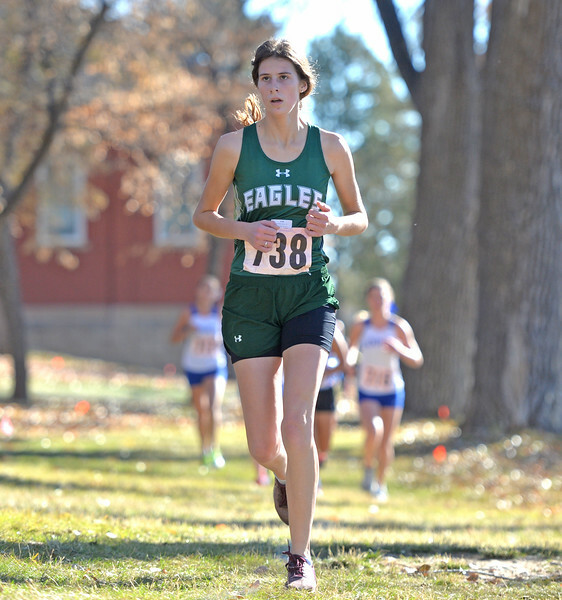 The Lady Eagles placed fifth as a team in the 2A race. 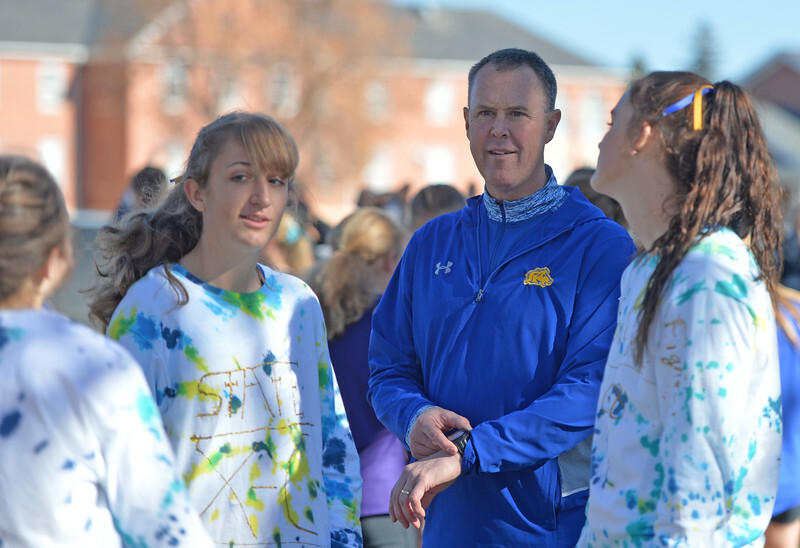 Sheridan High School head coach Art Baures talks with his girls team during the state cross-country meet at the Sheridan Veterans Affairs Medical Center Saturday, Oct. 20, 2018. 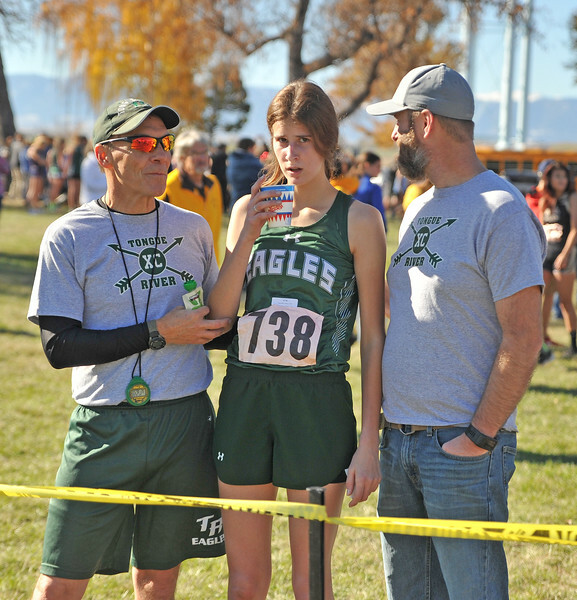 Tongue River’s Macey McArthur, center, recovers after her race with the support of head coach Tim Maze, left, during the state cross-country meet at the Veteran Affairs Medical Center in Sheridan on Saturday, Oct. 20, 2018. The Lady Eagles took fifth as a team in the 2A race. 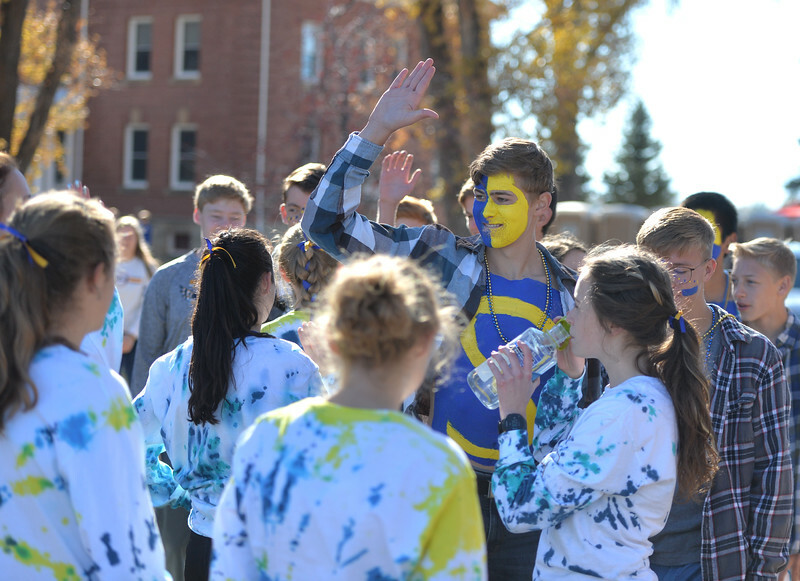 Members of the Sheridan High School junior varsity cross-country team pump up teammates during the state cross-country meet at the Sheridan Veterans Affairs Medical Center Saturday, Oct. 20, 2018. 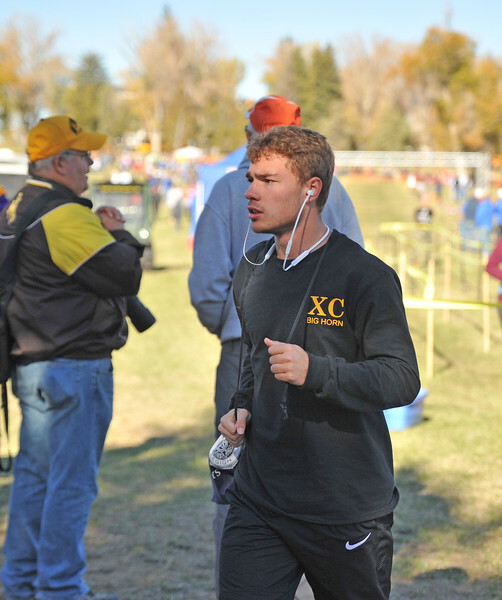 Big Horn’s Nathaniel Lydic warms up before his race during the state cross-country meet at the Veteran Affairs Medical Center in Sheridan on Saturday, Oct. 20, 2018. The Rams took third as a team in the 2A race. 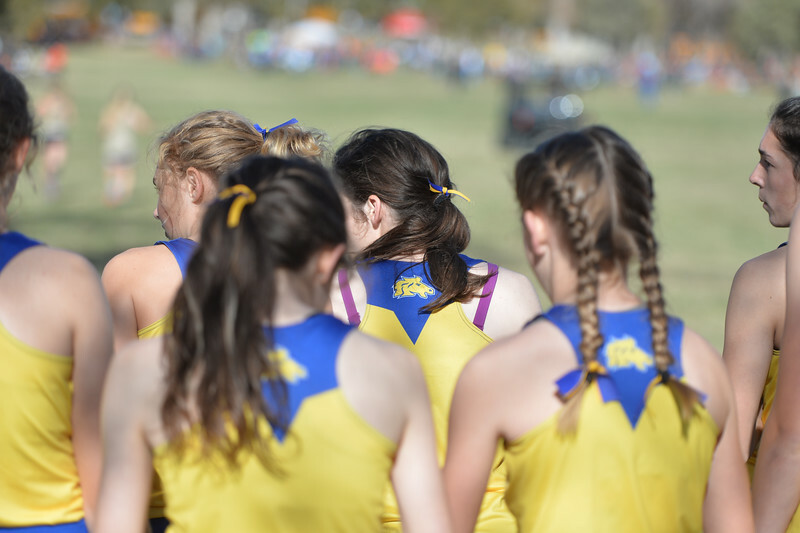 Sheridan runners wait for the start at the state cross-country meet at the Sheridan Veterans Affairs Medical Center Saturday, Oct. 20, 2018. 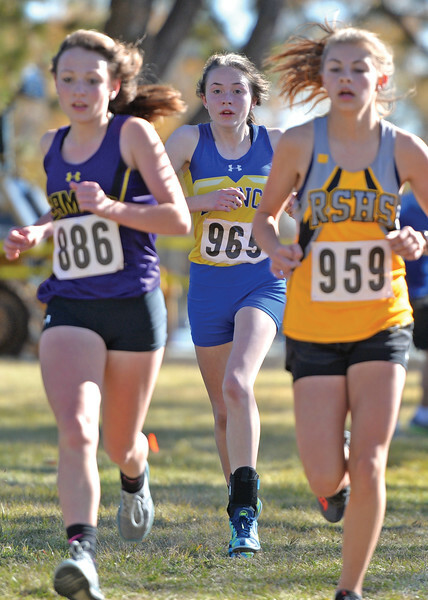 Sheridan’s Katie Turpin leads the pack during the state cross-country meet at the Sheridan Veterans Affairs Medical Center Saturday, Oct. 20, 2018. From left: Tongue River’s Kalie Bocek, Big Horn’s Elizabeth Foley and Tongue River’s Chloe Wilson smile after their race during the state cross-country meet at the Veteran Affairs Medical Center in Sheridan on Saturday, Oct. 20, 2018. 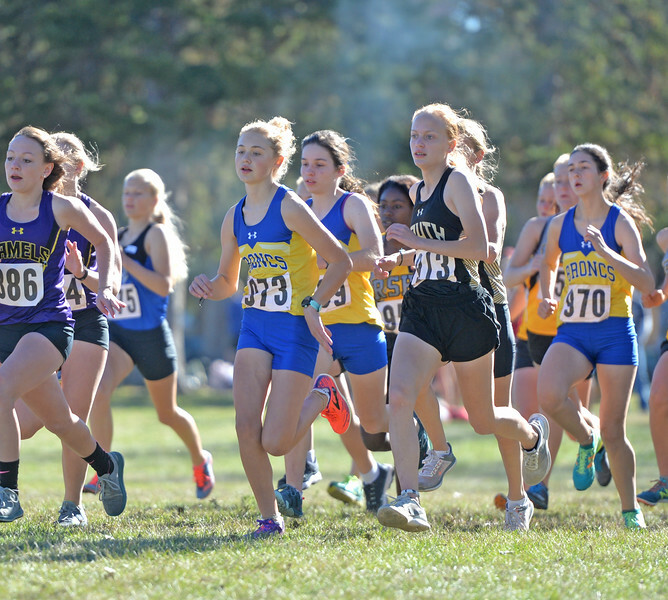 Sheridan’s Sarah Gonda leads a pack of runners during the state cross-country meet at the Sheridan Veterans Affairs Medical Center Saturday, Oct. 20, 2018. Sheridan’s Katie Turpin races during the state cross-country meet at the Sheridan Veterans Affairs Medical Center Saturday, Oct. 20, 2018. 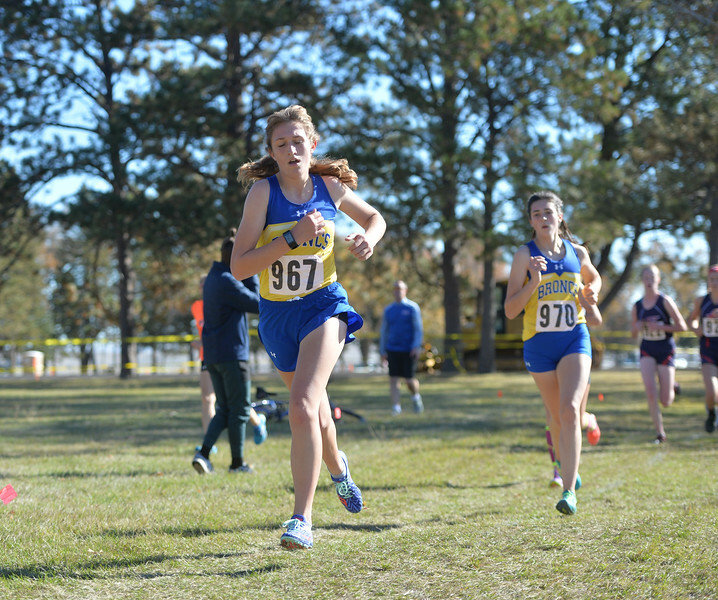 Sheridan’s Kate Moran battles for position during the state cross-country meet at the Sheridan Veterans Affairs Medical Center Saturday, Oct. 20, 2018. Sheridan’s Kate Moran leads a pack of runners during the state cross-country meet at the Sheridan Veterans Affairs Medical Center Saturday, Oct. 20, 2018. 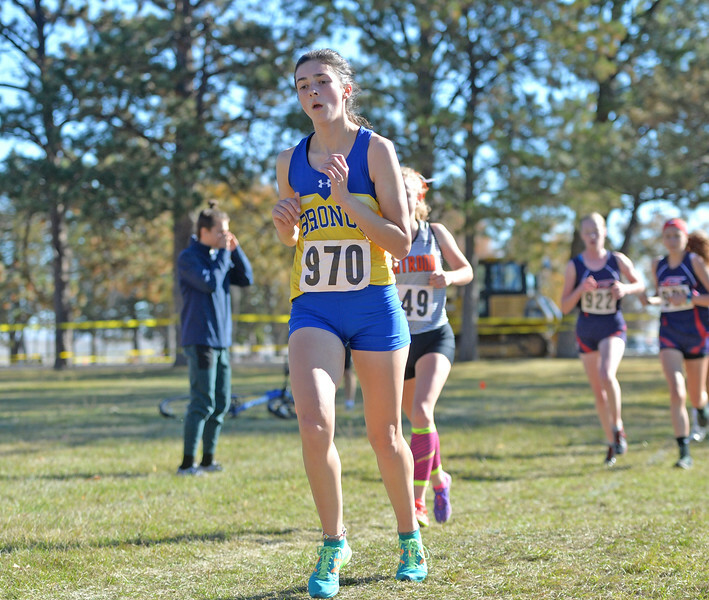 Sheridan’s Sylvia Brown keeps pace during the state cross-country meet at the Sheridan Veterans Affairs Medical Center Saturday, Oct. 20, 2018. 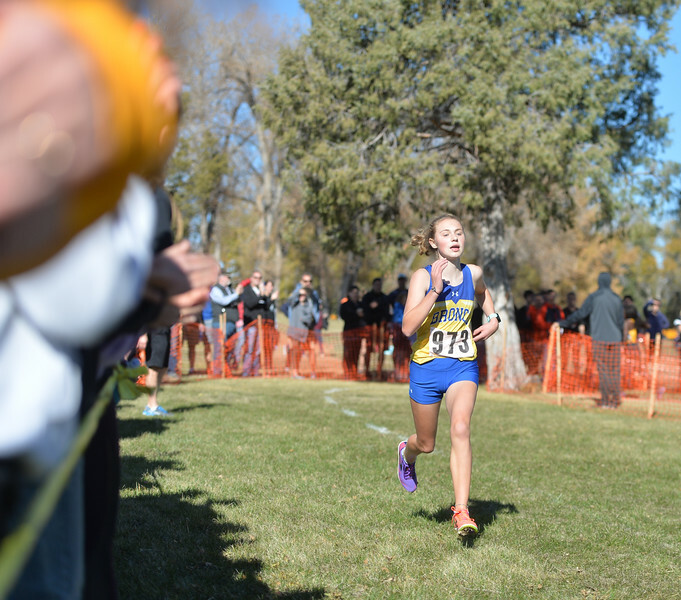 Sheridan’s Katie Turpin runs toward the finish line during the state cross-country meet at the Sheridan Veterans Affairs Medical Center Saturday, Oct. 20, 2018. 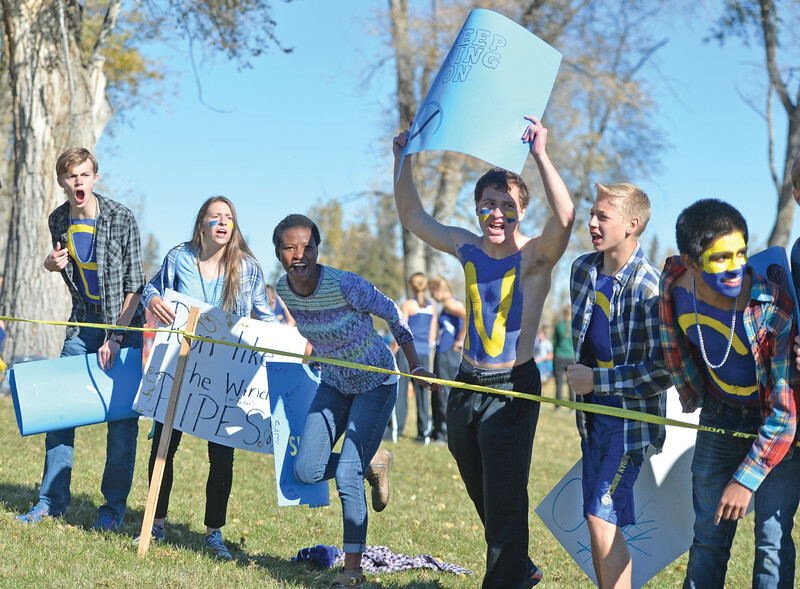 Members of the Sheridan High School cross-country team cheer during the state cross-country meet at the Sheridan Veterans Affairs Medical Center Saturday, Oct. 20, 2018. 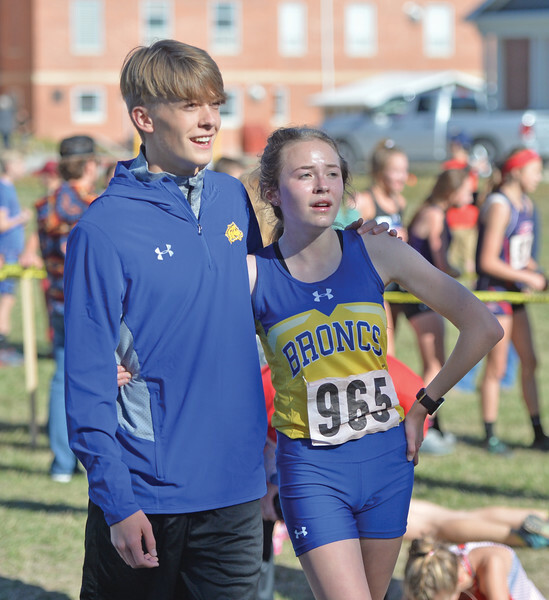 Sheridan’s Timothy Brown and twin sister Sylvia Brown walk after the finish of the girls 4A race during the state cross-country meet at the Sheridan Veterans Affairs Medical Center Saturday, Oct. 20, 2018. 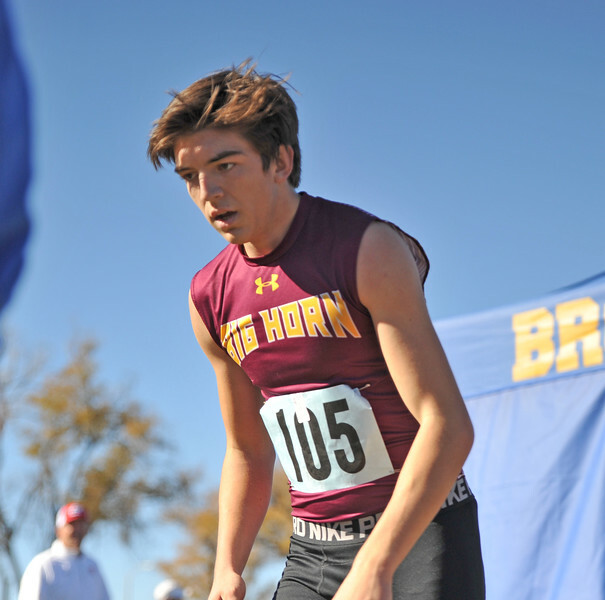 Big Horn’s Noah Harvey catches his breath after racing during the state cross-country meet at the Veteran Affairs Medical Center in Sheridan on Saturday, Oct. 20, 2018. 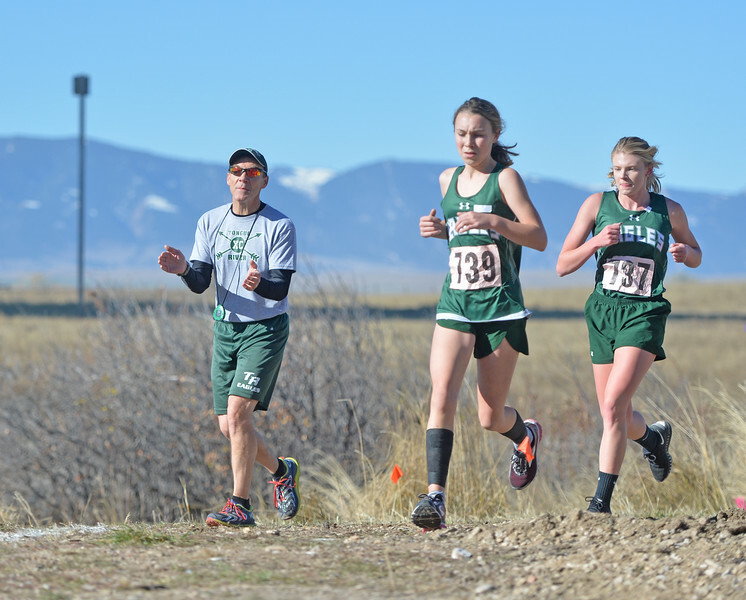 Harvey took seventh in the 2A race and the Rams finished third. 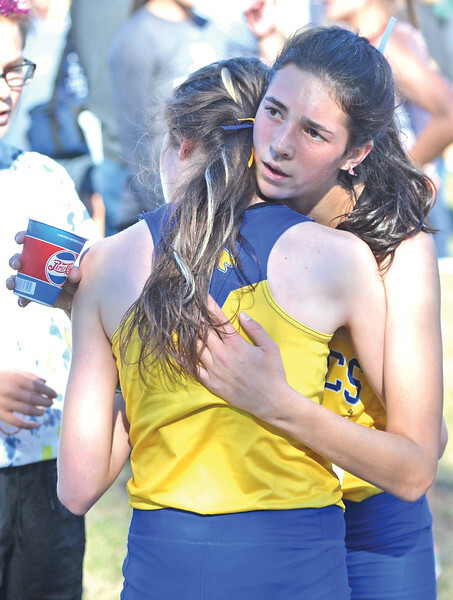 Sheridan’s Piper O’Dell hugs Sylvia Brown during the state cross-country meet at the Sheridan Veterans Affairs Medical Center Saturday, Oct. 20, 2018. 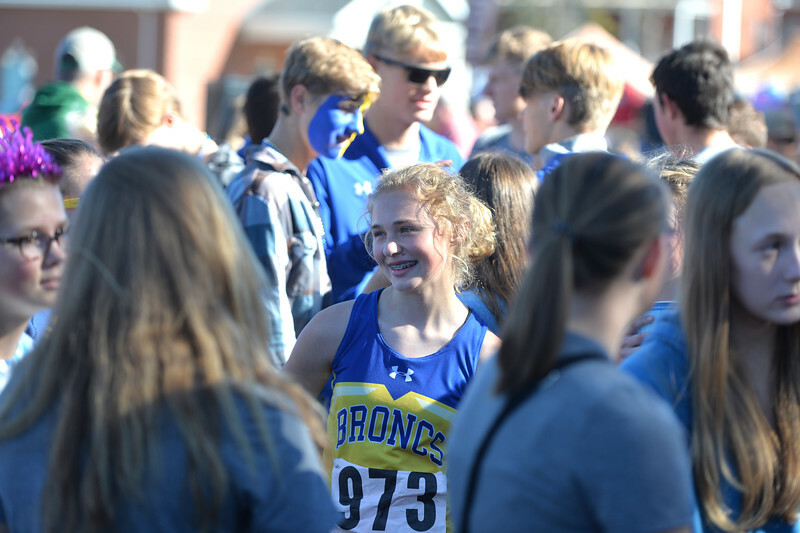 Sheridan’s Katie Turpin smiles during the state cross-country meet at the Sheridan Veterans Affairs Medical Center Saturday, Oct. 20, 2018. 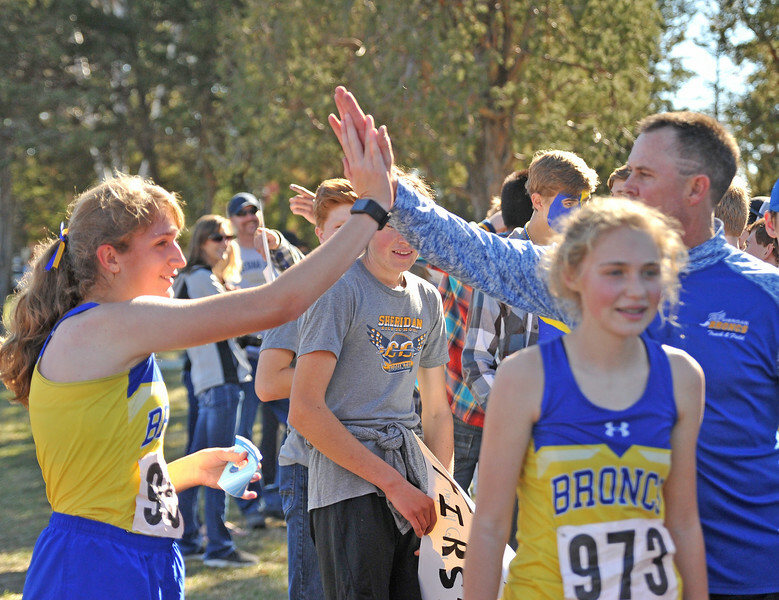 Sheridan’s Sarah Gonda, left, high-fives head coach Art Baures after her race during the state cross-country meet at the Veteran Affairs Medical Center in Sheridan on Saturday, Oct. 20, 2018. 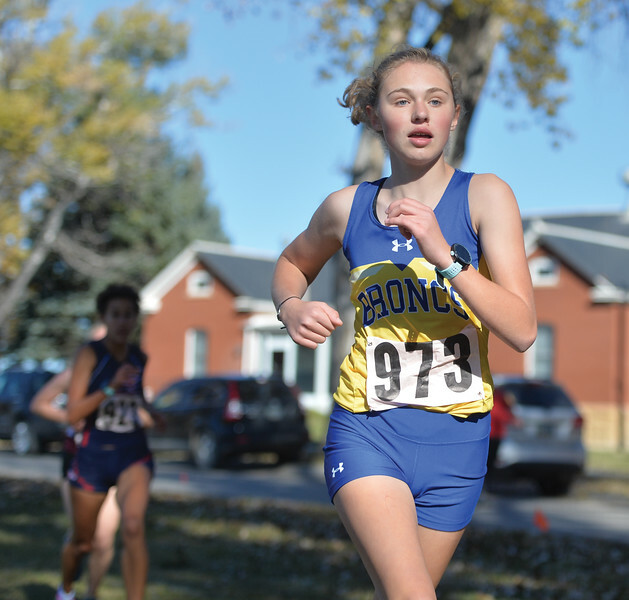 The Lady Broncs took fifth as a team in the 4A race. Sheridan’s Garett Avery leads a pack of runners during the state cross-country meet at the Sheridan Veterans Affairs Medical Center Saturday, Oct. 20, 2018. 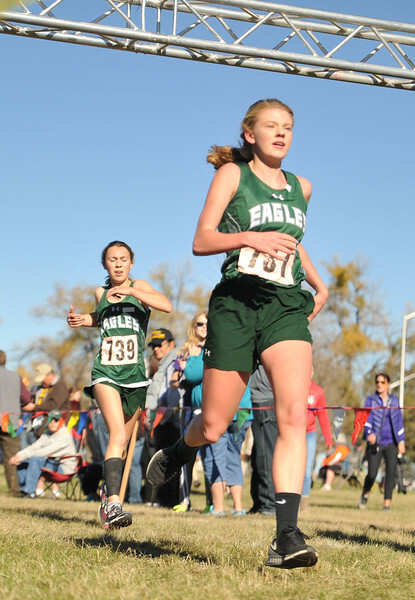 Tongue River’s Kalie Bocek, right, and Chloe Wilson cross the finish line during the state cross-country meet at the Veteran Affairs Medical Center in Sheridan on Saturday, Oct. 20, 2018. The Lady Eagles took fifth as a team in the 2A race. 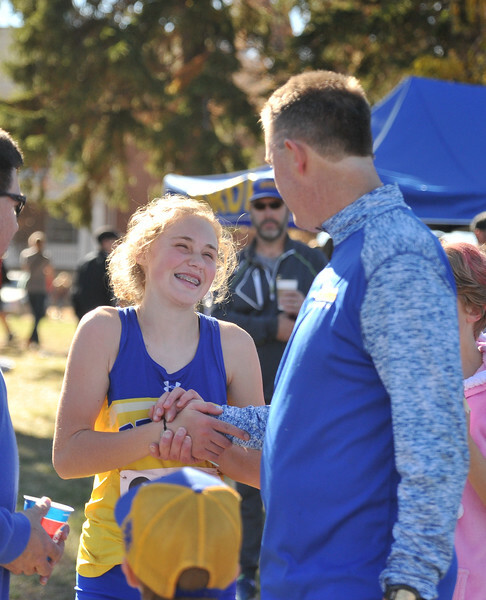 Sheridan head coach Art Baures, right, congratulates Katie Turpin after her race during the state cross-country meet at the Veteran Affairs Medical Center in Sheridan on Saturday, Oct. 20, 2018. 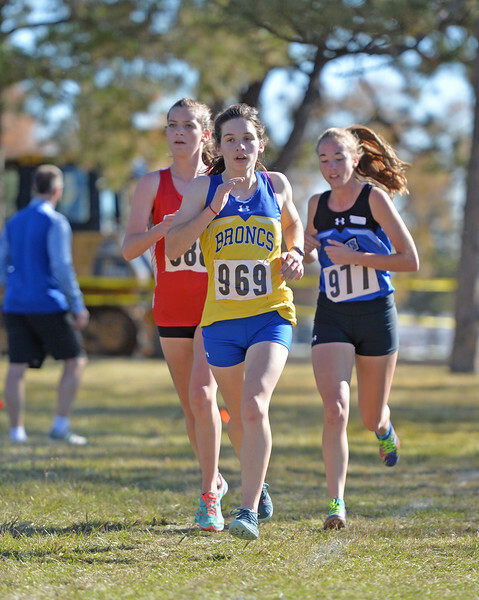 The Lady Broncs placed fifth as a team in the 4A race. 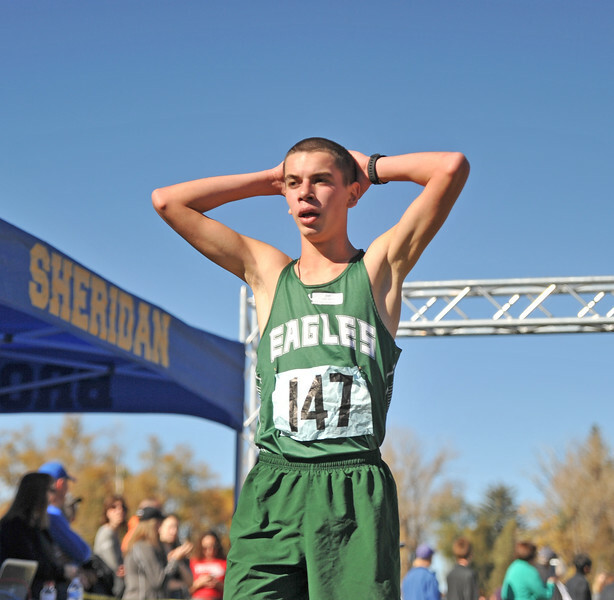 Big Horn’s Nathaniel Lydic reacts after finishing his race during the state cross-country meet at the Veteran Affairs Medical Center in Sheridan on Saturday, Oct. 20, 2018. The Rams took third as a team in the 2A race. 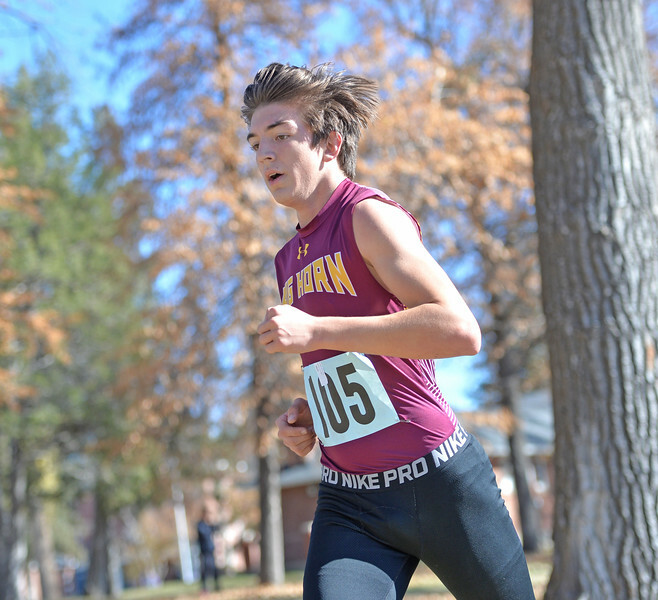 Sheridan’s David Standish races during the state cross-country meet at the Sheridan Veterans Affairs Medical Center Saturday, Oct. 20, 2018. 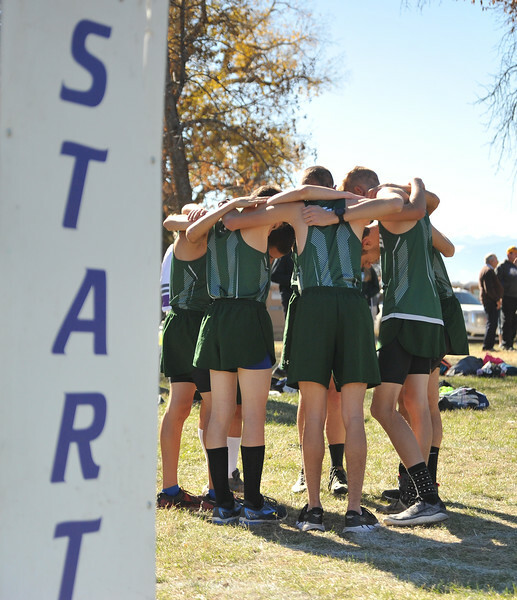 The Tongue River boys team huddles before its race during the state cross-country meet at the Veteran Affairs Medical Center in Sheridan on Saturday, Oct. 20, 2018. The Eagles took fourth as a team in the 2A race. 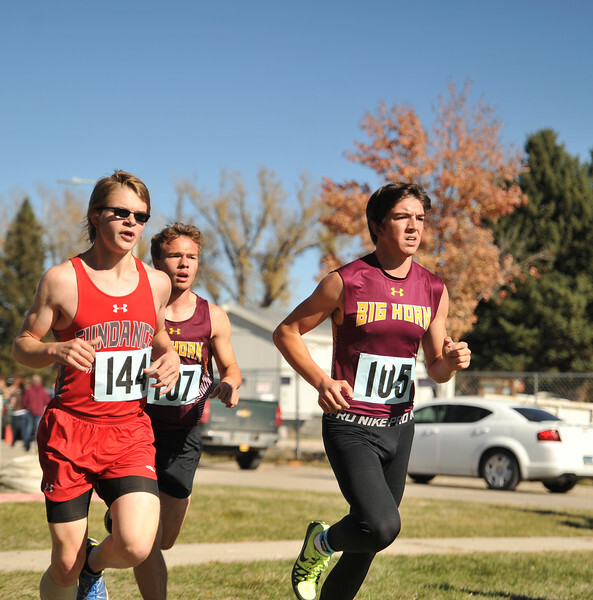 From left: Sundance’s Titus Schelling, Big Horn’s Nathaniel Lydic and Noah Harvey race during the state cross-country meet at the Veteran Affairs Medical Center in Sheridan on Saturday, Oct. 20, 2018. The Rams placed third as a team in the 2A race. 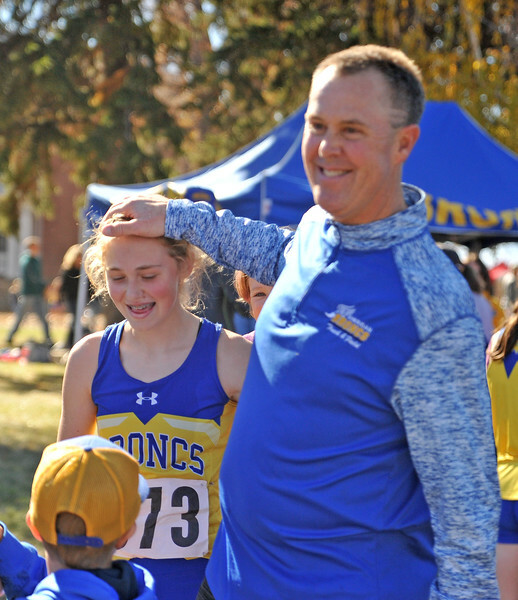 Sheridan’s Katie Turpin smiles with head coach Art Baures after her race during the state cross-country meet at the Veteran Affairs Medical Center in Sheridan on Saturday, Oct. 20, 2018. The Lady Broncs took fifth as a team. 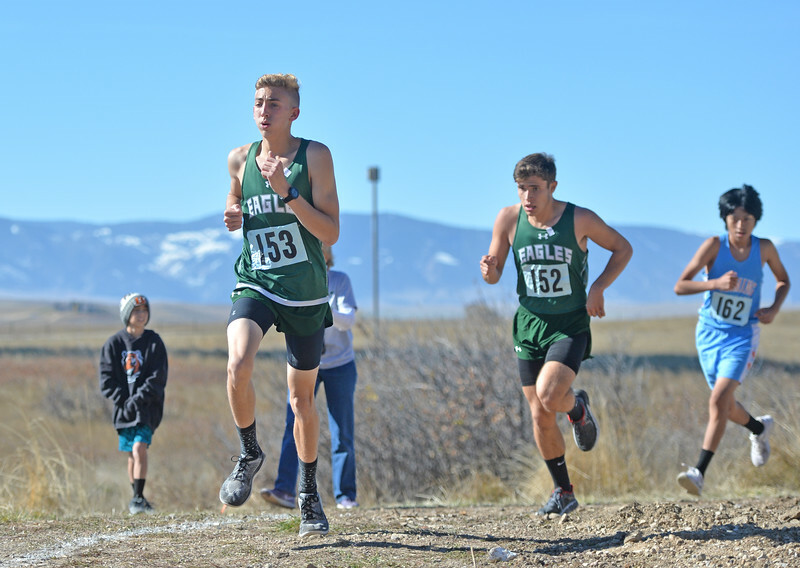 Tongue River’s Cooper Vollmer, left, and Jason Barron race during the state cross-country meet at the Veteran Affairs Medical Center in Sheridan on Saturday, Oct. 20, 2018. The Eagles took fourth as a team in the 2A race. 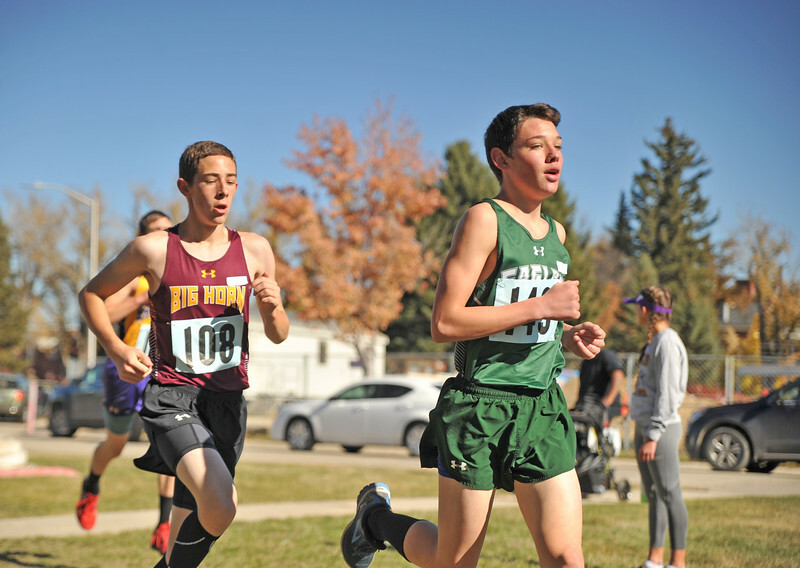 Big Horn’s Bridger Michaud, left, and Tongue River’s Azariah Benevides race during the state cross-country meet at the Veteran Affairs Medical Center in Sheridan on Saturday, Oct. 20, 2018. 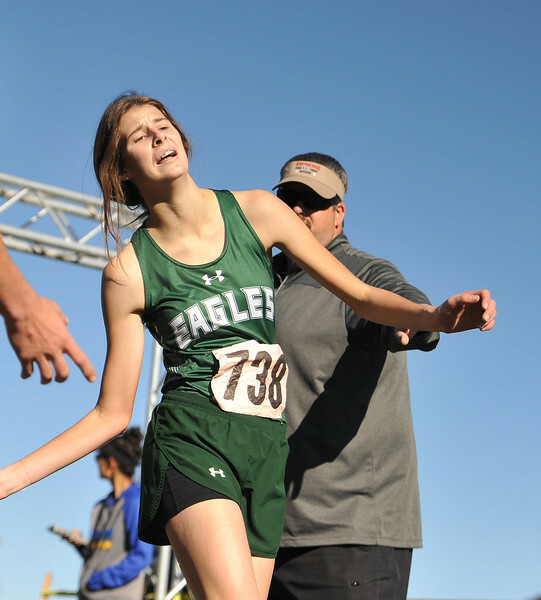 The Rams took third and the Eagles took fourth in the 2A race. Sheridan’s Timothy Brown leads a pack of runners during the state cross-country meet at the Sheridan Veterans Affairs Medical Center Saturday, Oct. 20, 2018. 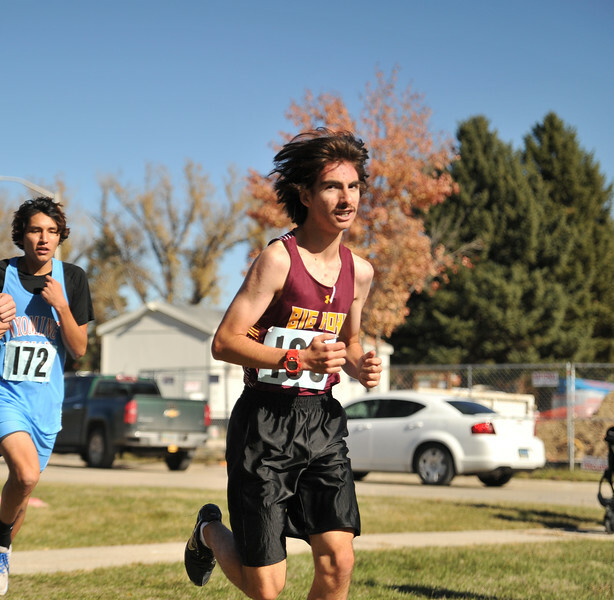 Big Horn’s Cameron Tift races during the state cross-country meet at the Veteran Affairs Medical Center in Sheridan on Saturday, Oct. 20, 2018. The Rams took third in the 2A race. 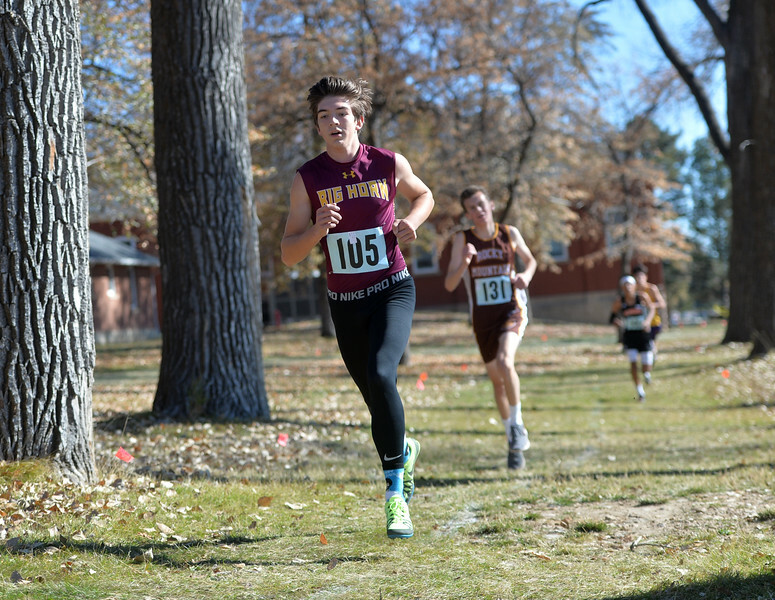 Tongue River’s Jett Walker leads a pack of runners during the state cross-country meet at the Sheridan Veterans Affairs Medical Center Saturday, Oct. 20, 2018. 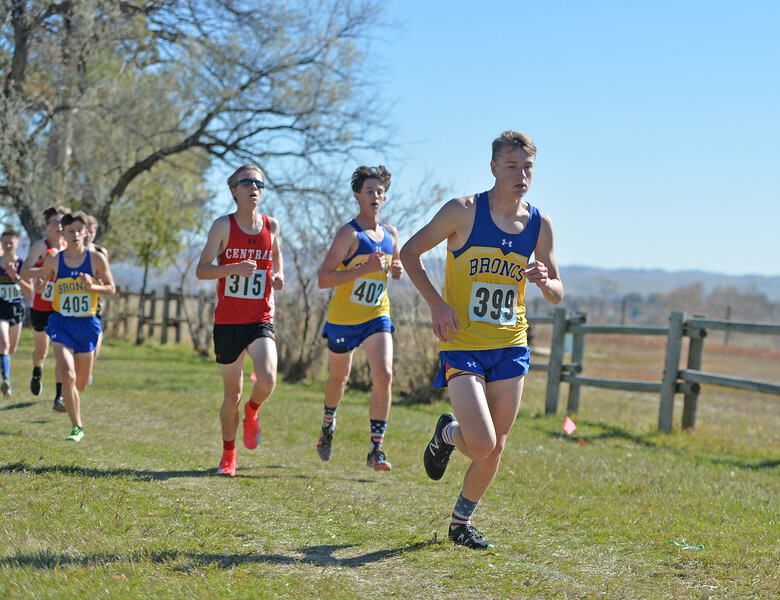 Big Horn’s JB Brogdan leads a pack of runners during the state cross-country meet at the Sheridan Veterans Affairs Medical Center Saturday, Oct. 20, 2018. 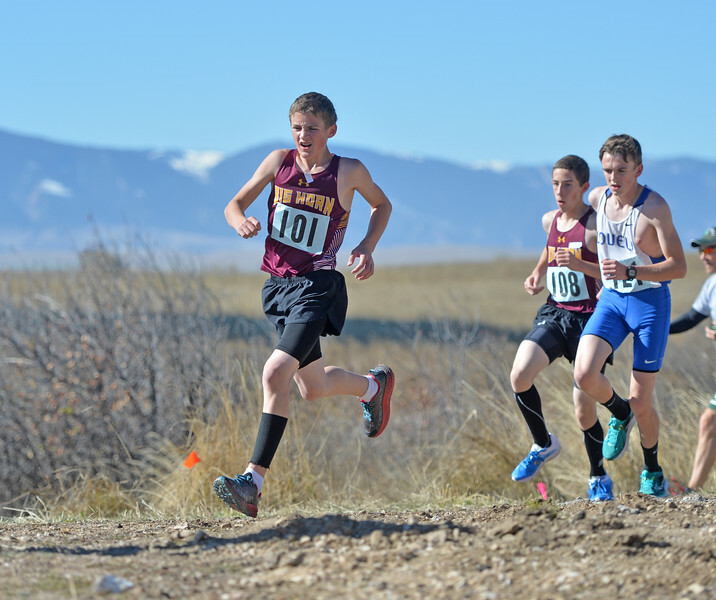 Big Horn’s Noah Harvey leads a pack of runners during the state cross-country meet at the Sheridan Veterans Affairs Medical Center Saturday, Oct. 20, 2018. 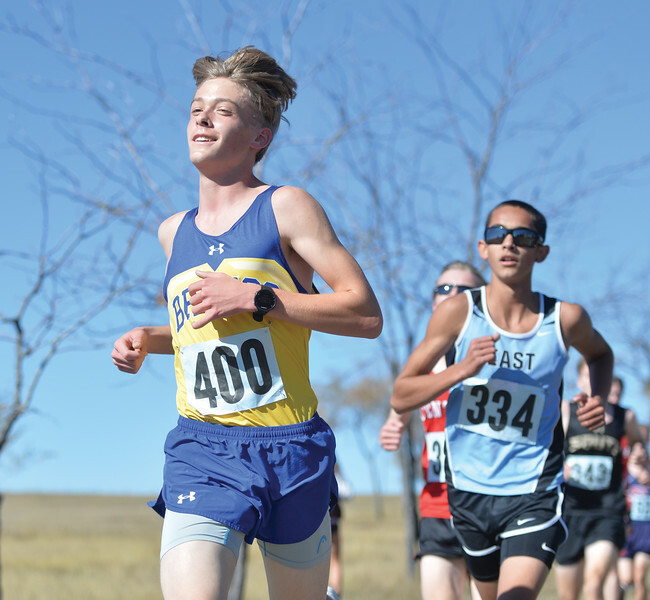 Big Horn’s Noah Harvey during the state cross-country meet at the Sheridan Veterans Affairs Medical Center Saturday, Oct. 20, 2018. 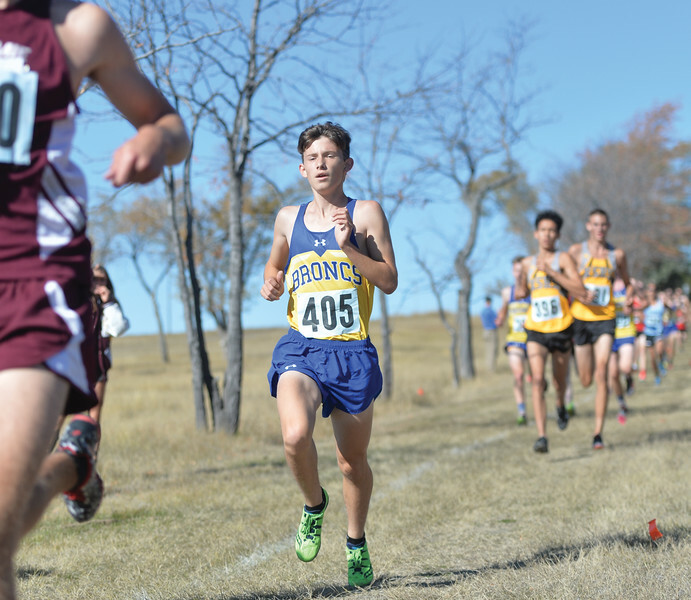 Tongue River’s Jason Barron leads a pack of runners during the state cross-country meet at the Sheridan Veterans Affairs Medical Center Saturday, Oct. 20, 2018. Sheridan’s Piper O’Dell leads a pack of runners during the state cross-country meet at the Sheridan Veterans Affairs Medical Center Saturday, Oct. 20, 2018. 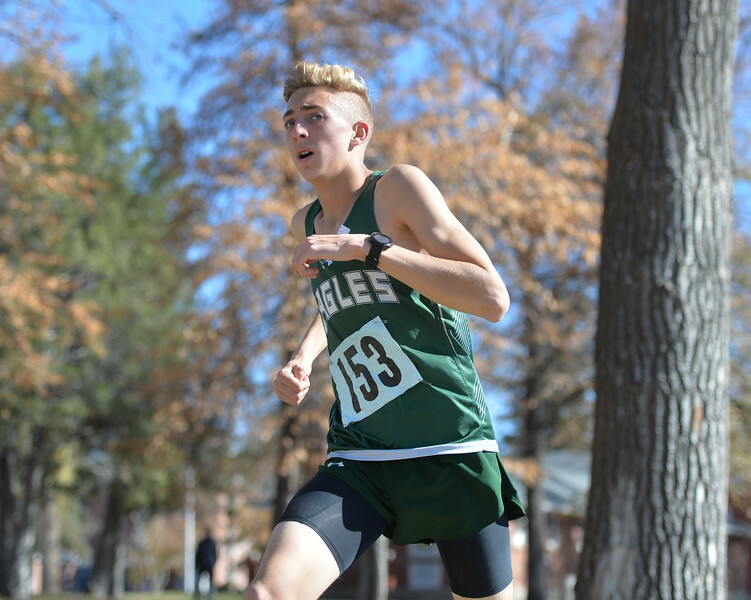 Tongue River’s Jett Walker races during the state cross-country meet at the Sheridan Veterans Affairs Medical Center Saturday, Oct. 20, 2018. 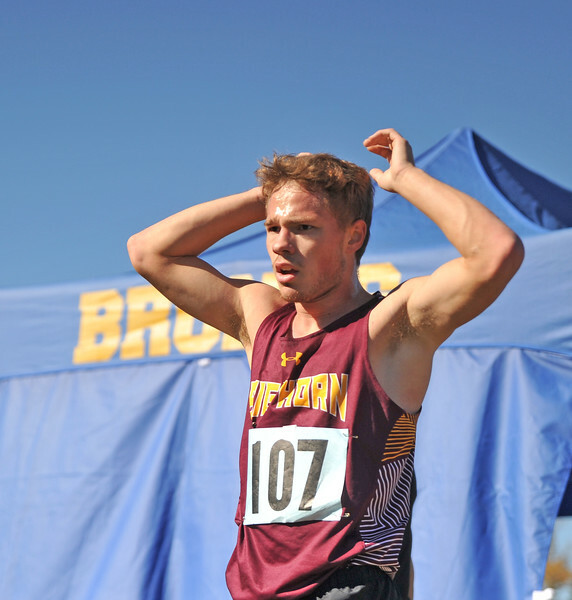 Tongue River’s Jason Barron reacts after finishing his race during the state cross-country meet at the Veteran Affairs Medical Center in Sheridan on Saturday, Oct. 20, 2018. 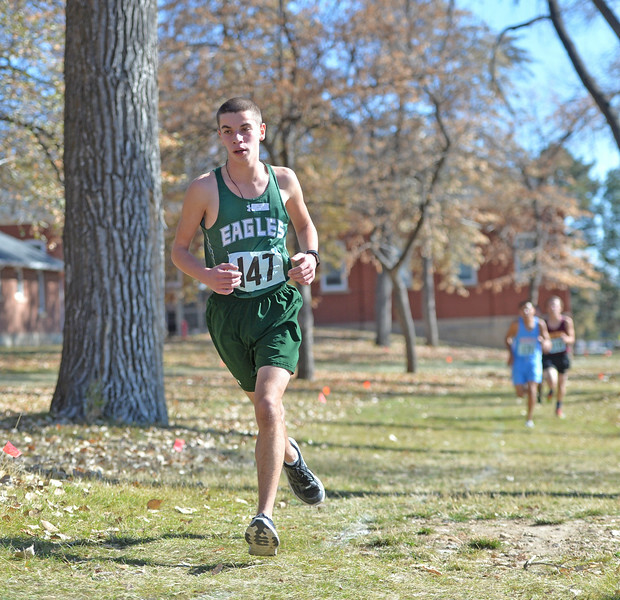 Barron placed 13th in the 2A race and the Eagles took fourth. 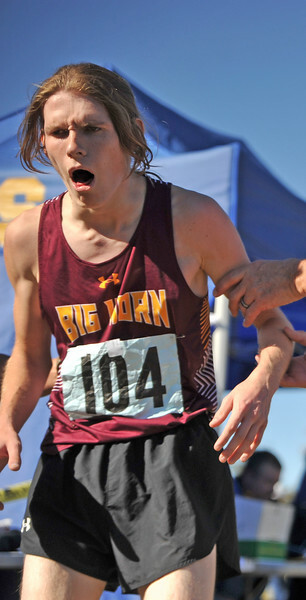 Big Horn’s Kobie Cummins reacts after finishing his race during the state cross-country meet at the Veteran Affairs Medical Center in Sheridan on Saturday, Oct. 20, 2018. The Rams placed third as a team in the 2A race. 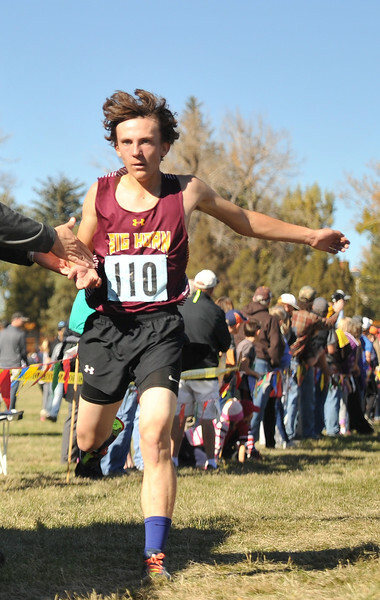 Big Horn’s Billy Watson crosses the finish line during the state cross-country meet at the Veteran Affairs Medical Center in Sheridan on Saturday, Oct. 20, 2018. The Rams placed third as a team in the 2A race. 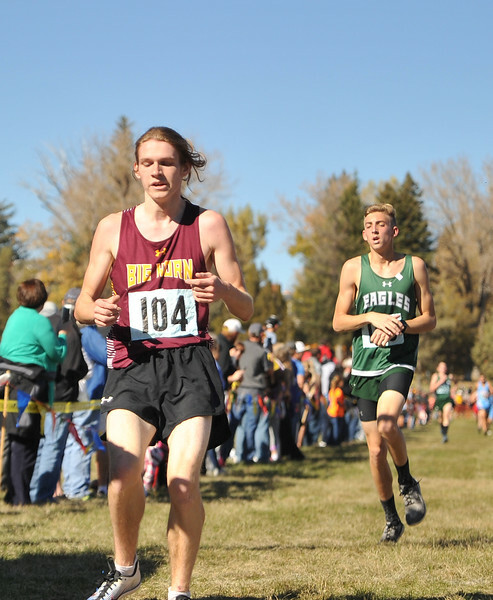 Big Horn’s Kobie Cummins, left, and Tongue River’s Jett Walker cross the finish line during the state cross-country meet at the Veteran Affairs Medical Center in Sheridan on Saturday, Oct. 20, 2018. 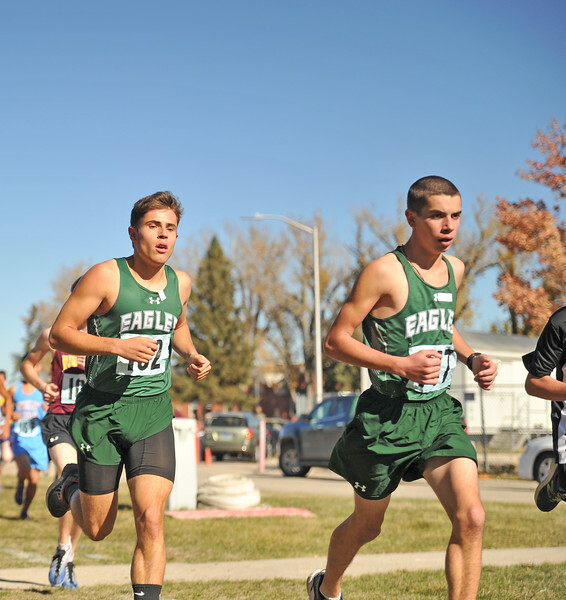 The Rams took third and the Eagles took fourth in the 2A race.